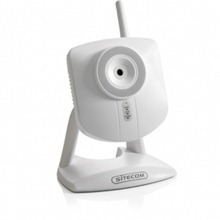 This Wireless Internet Security Camera is ideal for wireless monitoring of various spaces at home (baby’s bedroom or your ­living room) or the office (reception area or warehouse). By connecting the camera to your wireless network, you can access the live images recorded by the camera from any desktop PC or notebook via the Internet or Intranet. All you need is a web browser and an IP address. With the camera you can keep an eye on your home or office at any time from any location. Because of the ­extensive wireless range, the camera does not need to be placed near the router, thereby offering optimum flexibility.